A higher-order function is a function that takes a function as an input or returns a function as output. We’ve already seen one type of higher order function: closures, functions returned by another function. The complement to a closure is a functional, a function that takes a function as an input and returns a vector as output. Here’s a simple functional: it calls the function provided as input with 1000 random uniform numbers. The chances are that you’ve already used a functional: the three most frequently used are lapply(), apply(), and tapply(). All three take a function as input (among other things) and return a vector as output. A common use of functionals is as an alternative to for loops. For loops have a bad rap in R. They have a reputation for being slow (although that reputation is only partly true, see modification in place for more details). But the real downside of for loops is that they’re not very expressive. A for loop conveys that it’s iterating over something, but doesn’t clearly convey a high level goal. Instead of using a for loop, it’s better to use a functional. Each functional is tailored for a specific task, so when you recognise the functional you know immediately why it’s being used. Functionals play other roles as well as replacements for for-loops. They are useful for encapsulating common data manipulation tasks like split-apply-combine, for thinking “functionally”, and for working with mathematical functions. Functionals reduce bugs in your code by better communicating intent. Functionals implemented in base R are well tested (i.e., bug-free) and efficient, because they’re used by so many people. Many are written in C, and use special tricks to enhance performance. That said, using functionals will not always produce the fastest code. Instead, it helps you clearly communicate and build tools that solve a wide range of problems. It’s a mistake to focus on speed until you know it’ll be a problem. Once you have clear, correct code you can make it fast using the techniques you’ll learn in improving the speed of your code. My first functional: lapply() introduces your first functional: lapply(). For loop functionals shows you variants of lapply() that produce different outputs, take different inputs, and distribute computation in different ways. Data structure functionals discusses functionals that work with more complex data structures like matrices and arrays. Functional programming teaches you about the powerful Reduce() and Filter() functions which are useful for working with lists. Mathematical functionals discusses functionals that you might be familiar with from mathematics, like root finding, integration, and optimisation. Loops that shouldn’t be converted to functions provides some important caveats about when you shouldn’t attempt to convert a loop into a functional. A family of functions finishes off the chapter by showing you how functionals can take a simple building block and use it to create a set of powerful and consistent tools. You’ll use closures frequently used in conjunction with functionals. If you need a refresher, review closures. From this code, you can see that lapply() is a wrapper for a common for loop pattern: create a container for output, apply f() to each component of a list, and fill the container with the results. All other for loop functionals are variations on this theme: they simply use different types of input or output. # What class is each column? ## "numeric" "numeric" "numeric" "numeric" "numeric" "numeric" "numeric"
The pieces of x are always supplied as the first argument to f. If you want to vary a different argument, you can use an anonymous function. The following example varies the amount of trimming applied when computing the mean of a fixed x. Typically you’d use the first form because lapply() takes care of saving the output for you. However, if you need to know the position or name of the element you’re working with, you should use the second or third form. Both give you an element’s position (i, nm) and value (xs[[i]], xs[[nm]]). If you’re struggling to solve a problem using one form, you might find it easier with another. Why are the following two invocations of lapply() equivalent? The function below scales a vector so it falls in the range [0, 1]. How would you apply it to every column of a data frame? How would you apply it to every numeric column in a data frame? Fit the model mpg ~ disp to each of the bootstrap replicates of mtcars in the list below by using a for loop and lapply(). Can you do it without an anonymous function? For each model in the previous two exercises, extract R2 using the function below. The key to using functionals in place of for loops is recognising that common looping patterns are already implemented in existing base functionals. Once you’ve mastered these existing functionals, the next step is to start writing your own: if you discover you’re duplicating the same looping pattern in many places, you should extract it out into its own function. sapply() and vapply(), variants of lapply() that produce vectors, matrices, and arrays as output, instead of lists. Map() and mapply() which iterate over multiple input data structures in parallel. mclapply() and mcMap(), parallel versions of lapply() and Map(). Writing a new function, rollapply(), to solve a new problem. sapply() and vapply() are very similar to lapply() except they simplify their output to produce an atomic vector. While sapply() guesses, vapply() takes an additional argument specifying the output type. sapply() is great for interactive use because it saves typing, but if you use it inside your functions you’ll get weird errors if you supply the wrong type of input. vapply() is more verbose, but gives more informative error messages and never fails silently. It is better suited for use inside other functions. The following example illustrates these differences. When given a data frame, sapply() and vapply() return the same results. When given an empty list, sapply() returns another empty list instead of the more correct zero-length logical vector. If the function returns results of different types or lengths, sapply() will silently return a list, while vapply() will throw an error. sapply() is fine for interactive use because you’ll normally notice if something goes wrong, but it’s dangerous when writing functions. The following example illustrates a possible problem when extracting the class of columns in a data frame: if you falsely assume that class only has one value and use sapply(), you won’t find out about the problem until some future function is given a list instead of a character vector. sapply() is a thin wrapper around lapply() that transforms a list into a vector in the final step. vapply() is an implementation of lapply() that assigns results to a vector (or matrix) of appropriate type instead of as a list. The following code shows a pure R implementation of the essence of sapply() and vapply() (the real functions have better error handling and preserve names, among other things). 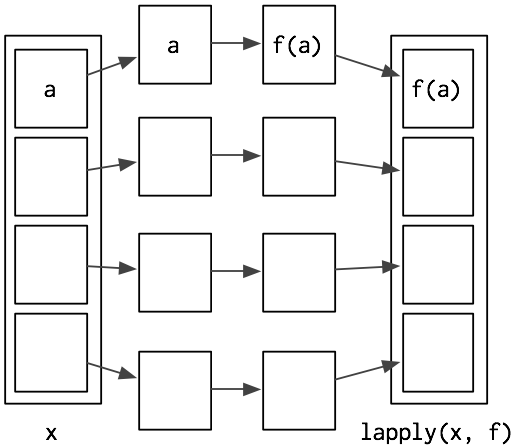 vapply() and sapply() have different outputs from lapply(). The following section discusses Map(), which has different inputs. With lapply(), only one argument to the function varies; the others are fixed. This makes it poorly suited for some problems. For example, how would you find a weighted mean when you have two lists, one of observations and the other of weights? Note that the order of arguments is a little different: function is the first argument for Map() and the second for lapply(). There’s a natural equivalence between Map() and lapply() because you can always convert a Map() to an lapply() that iterates over indices. But using Map() is more concise, and more clearly indicates what you’re trying to do. Map is useful whenever you have two (or more) lists (or data frames) that you need to process in parallel. For example, another way of standardising columns is to first compute the means and then divide by them. We could do this with lapply(), but if we do it in two steps, we can more easily check the results at each step, which is particularly important if the first step is more complicated. We’ll see a more compact way to express the same idea in the next chapter. It’s equivalent to mapply with simplify = FALSE, which is almost always what you want. Instead of using an anonymous function to provide constant inputs, mapply has the MoreArgs argument that takes a list of extra arguments that will be supplied, as is, to each call. This breaks R’s usual lazy evaluation semantics, and is inconsistent with other functions. In brief, mapply() adds more complication for little gain. 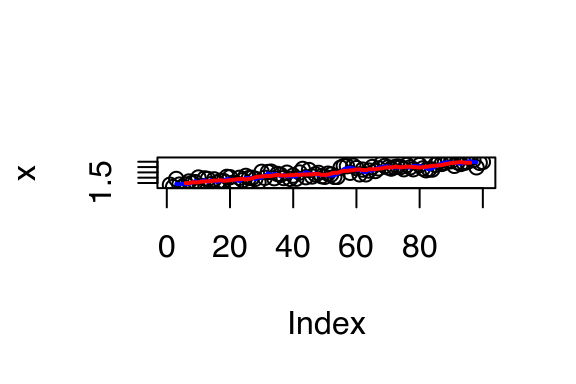 But if the noise was more variable (i.e., it has a longer tail), you might worry that your rolling mean was too sensitive to outliers. Instead, you might want to compute a rolling median. This is effectively the same as the implementation in zoo::rollapply(), which provides many more features and much more error checking. In this case, mclapply() is actually slower than lapply(). This is because the cost of the individual computations is low, and additional work is needed to send the computation to the different cores and to collect the results. While increasing the number of cores will not always lead to linear improvement, switching from lapply() or Map() to its parallelised forms can dramatically improve computational performance. Compute the standard deviation of every column in a numeric data frame. Why is using sapply() to get the class() of each element in a data frame dangerous? The following code simulates the performance of a t-test for non-normal data. Use sapply() and an anonymous function to extract the p-value from every trial. Extra challenge: get rid of the anonymous function by using [[ directly. What does replicate() do? What sort of for loop does it eliminate? Why do its arguments differ from lapply() and friends? Implement a version of lapply() that supplies FUN with both the name and the value of each component. Implement a combination of Map() and vapply() to create an lapply() variant that iterates in parallel over all of its inputs and stores its outputs in a vector (or a matrix). What arguments should the function take? Implement mcsapply(), a multicore version of sapply(). Can you implement mcvapply(), a parallel version of vapply()? Why or why not? apply(), sweep(), and outer() work with matrices. tapply() summarises a vector by groups defined by another vector. the plyr package, which generalises tapply() to make it easy to work with data frames, lists, or arrays as inputs, and data frames, lists, or arrays as outputs. MARGIN, an integer vector giving the dimensions to summarise over, 1 = rows, 2 = columns, etc. sweep() allows you to “sweep” out the values of a summary statistic. It is often used with apply() to standardise arrays. The following example scales the rows of a matrix so that all values lie between 0 and 1. “Using apply, sapply, lapply in R” by Peter Werner. “The infamous apply function” by Slawa Rokicki. “The R apply function - a tutorial with examples” by axiomOfChoice. The stackoverflow question “R Grouping functions: sapply vs. lapply vs. apply vs. tapply vs. by vs. aggregate”. Being able to rewrite tapply() as a combination of split() and sapply() is a good indication that we’ve identified some useful building blocks. With tapply() and sapply(), the simplify argument is called simplify. With mapply(), it’s called SIMPLIFY. With apply(), the argument is absent. vapply() is a variant of sapply() that allows you to describe what the output should be, but there are no corresponding variants for tapply(), apply(), or Map(). The first argument of most base functionals is a vector, but the first argument in Map() is a function. Each of these functions splits up the input, applies a function to each piece, and then combines the results. Overall, this process is called “split-apply-combine”. You can read more about it and plyr in “The Split-Apply-Combine Strategy for Data Analysis”, an open-access article published in the Journal of Statistical Software. How does apply() arrange the output? Read the documentation and perform some experiments. There’s no equivalent to split() + vapply(). Should there be? When would it be useful? Implement one yourself. Implement a pure R version of split(). (Hint: use unique() and subsetting.) Can you do it without a for loop? What other types of input and output are missing? Brainstorm before you look up some answers in the plyr paper. Another way of thinking about functionals is as a set of general tools for altering, subsetting, and collapsing lists. Every functional programming language has three tools for this: Map(), Reduce(), and Filter(). We’ve seen Map() already, and the following sections describe Reduce(), a powerful tool for extending two-argument functions, and Filter(), a member of an important class of functionals that work with predicates, functions that return a single TRUE or FALSE. Reduce() reduces a vector, x, to a single value by recursively calling a function, f, two arguments at a time. It combines the first two elements with f, then combines the result of that call with the third element, and so on. Calling Reduce(f, 1:3) is equivalent to f(f(1, 2), 3). Reduce is also known as fold, because it folds together adjacent elements in the list. The real Reduce() is more complicated because it includes arguments to control whether the values are reduced from the left or from the right (right), an optional initial value (init), and an option to output intermediate results (accumulate). A predicate is a function that returns a single TRUE or FALSE, like is.character, all, or is.NULL. A predicate functional applies a predicate to each element of a list or data frame. There are three useful predicate functionals in base R: Filter(), Find(), and Position(). Filter() selects only those elements which match the predicate. Find() returns the first element which matches the predicate (or the last element if right = TRUE). Position() returns the position of the first element that matches the predicate (or the last element if right = TRUE). Why isn’t is.na() a predicate function? What base R function is closest to being a predicate version of is.na()? Use Filter() and vapply() to create a function that applies a summary statistic to every numeric column in a data frame. What’s the relationship between which() and Position()? What’s the relationship between where() and Filter()? Implement Any(), a function that takes a list and a predicate function, and returns TRUE if the predicate function returns TRUE for any of the inputs. Implement All() similarly. Functionals are very common in mathematics. The limit, the maximum, the roots (the set of points where f(x) = 0), and the definite integral are all functionals: given a function, they return a single number (or vector of numbers). At first glance, these functions don’t seem to fit in with the theme of eliminating loops, but if you dig deeper you’ll find out that they are all implemented using an algorithm that involves iteration. In statistics, optimisation is often used for maximum likelihood estimation (MLE). In MLE, we have two sets of parameters: the data, which is fixed for a given problem, and the parameters, which vary as we try to find the maximum. These two sets of parameters make the problem well suited for closures. Combining closures with optimisation gives rise to the following approach to solving MLE problems. The following example shows how we might find the maximum likelihood estimate for λ, if our data come from a Poisson distribution. First, we create a function factory that, given a dataset, returns a function that computes the negative log likelihood (NLL) for parameter lambda. In R, it’s common to work with the negative since optimise() defaults to finding the minimum. 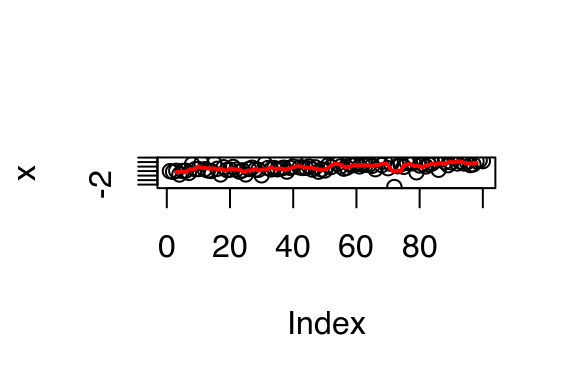 Note how the closure allows us to precompute values that are constant with respect to the data. We can use this function factory to generate specific NLL functions for input data. Then optimise() allows us to find the best values (the maximum likelihood estimates), given a generous starting range. We can check that these values are correct by comparing them to the analytic solution: in this case, it’s just the mean of the data, 32.1 and 5.4666667. Another important mathematical functional is optim(). It is a generalisation of optimise() that works with more than one dimension. If you’re interested in how it works, you might want to explore the Rvmmin package, which provides a pure-R implementation of optim(). Interestingly Rvmmin is no slower than optim(), even though it is written in R, not C. For this problem, the bottleneck lies not in controlling the optimisation but with having to evaluate the function multiple times. Implement arg_max(). It should take a function and a vector of inputs, and return the elements of the input where the function returns the highest value. For example, arg_max(-10:5, function(x) x ^ 2) should return -10. arg_max(-5:5, function(x) x ^ 2) should return c(-5, 5). Also implement the matching arg_min() function. Challenge: read about the fixed point algorithm. Complete the exercises using R.
It’s possible to torture these problems to use a functional, but it’s not a good idea. You’ll create code that is harder to understand, eliminating the main reason for using functionals in the first case. If you need to modify part of an existing data frame, it’s often better to use a for loop. For example, the following code performs a variable-by-variable transformation by matching the names of a list of functions to the names of variables in a data frame. The for loop is gone, but the code is longer and much harder to understand. The reader needs to understand <<- and how x[[y]] <<- z works (it’s not simple!). In short, we’ve taken a simple, easily understood for loop, and turned it into something few people will understand: not a good idea! It’s hard to convert a for loop into a functional when the relationship between elements is not independent, or is defined recursively. For example, exponential smoothing works by taking a weighted average of the current and previous data points. The exps() function below implements exponential smoothing with a for loop. We can’t eliminate the for loop because none of the functionals we’ve seen allow the output at position i to depend on both the input and output at position i - 1. One way to eliminate the for loop in this case is to solve the recurrence relation by removing the recursion and replacing it with explicit references. This requires a new set of mathematical tools, and is challenging, but it can pay off by producing a simpler function. This is a common problem when you’re writing simulations. In this case we can remove the loop by recognising a special feature of the problem. Here we’re counting the number of successes before Bernoulli trial with p = 0.1 fails. This is a geometric random variable, so you could replace the code with i <- rgeom(1, 0.1). Reformulating the problem in this way is hard to do in general, but you’ll benefit greatly if you can do it for your problem. To finish off the chapter, this case study shows how you can use functionals to take a simple building block and make it powerful and general. I’ll start with a simple idea, adding two numbers together, and use functionals to extend it to summing multiple numbers, computing parallel and cumulative sums, and summing across array dimensions. I’ll also add an na.rm argument. A helper function will make this a bit easier: if x is missing it should return y, if y is missing it should return x, and if both x and y are missing then it should return another argument to the function: identity. This function is probably a bit more general than what we need now, but it’s useful if we implement other binary operators. This implies that add(NA, NA, na.rm = TRUE) must be 0, and hence identity = 0 is the correct default. These are incorrect. In the first case, we get a missing value even though we’ve explicitly asked to ignore them. In the second case, we get NULL instead of a length one numeric vector (as we do for every other set of inputs). r_add() is equivalent to sum(). It would be nice to have a vectorised version of add() so that we can perform the addition of two vectors of numbers in element-wise fashion. We could use Map() or vapply() to implement this, but neither is perfect. Map() returns a list, instead of a numeric vector, so we need to use simplify2array(). vapply() returns a vector but it requires us to loop over a set of indices. This is equivalent to cumsum(). Finally, we might want to define addition for more complicated data structures like matrices. We could create row and col variants that sum across rows and columns, respectively, or we could go the whole hog and define an array version that could sum across any arbitrary set of dimensions. These are easily implemented as combinations of r_add() and apply(). The first two are equivalent to rowSums() and colSums(). Since all variants were implemented by combining a simple binary operator (add()) and a well-tested functional (Reduce(), Map(), apply()), we know that our variants will behave consistently. We can apply the same infrastructure to other operators, especially those that might not have the full suite of variants in base R.
The downside of this approach is that these implementations are not that efficient. (For example, colSums(x) is much faster than apply(x, 2, sum).) However, even if they aren’t that fast, simple implementations are still a good starting point because they’re less likely to have bugs. When you create faster versions, you can compare the results to make sure your fast versions are still correct. If you enjoyed this section, you might also enjoy “List out of lambda”, a blog article by Steve Losh that shows how you can produce high level language structures (like lists) out of more primitive language features (like closures, aka lambdas). Implement smaller and larger functions that, given two inputs, return either the smaller or the larger value. Implement na.rm = TRUE: what should the identity be? (Hint: smaller(x, smaller(NA, NA, na.rm = TRUE), na.rm = TRUE) must be x, so smaller(NA, NA, na.rm = TRUE) must be bigger than any other value of x.) Use smaller and larger to implement equivalents of min(), max(), pmin(), pmax(), and new functions row_min() and row_max(). Create a table that has and, or, add, multiply, smaller, and larger in the columns and binary operator, reducing variant, vectorised variant, and array variants in the rows. Fill in the cells with the names of base R functions that perform each of the roles. Compare the names and arguments of the existing R functions. How consistent are they? How could you improve them? Complete the matrix by implementing any missing functions. How does paste() fit into this structure? What is the scalar binary function that underlies paste()? What are the sep and collapse arguments to paste() equivalent to? Are there any paste variants that don’t have existing R implementations?